Day 1 will totally depend on time of arrival; this day is described supposing that they arrive in the morning. Arriving at the airport, guests will be driven to their hotels and settled until lunch. Lunch will be served at: “Mitad al Mundo” (Middle of the world), where they can eat the traditional guinea pig if desired or other traditional food. Then we will bring them to the Ecuador’s mythic statue honoring the geologist’s discovery of what they thought was the middle of the world. 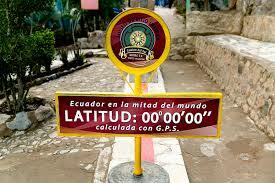 The second spot is the actual middle of the world, a few meters next to the touristic place, where travelers will learn scientific facts about the power of the earth, through the equator. They will for example put an egg on a nail, where it will stand more easily thanks to the gravity difference that exists right on the equator line. After this journey, we will take the guests for another cultural dinner, and then let them rest in their hotel. This region hosts one of the biggest indigenous market in South America. We will walk through hundreds of artisanal products, full of colors and culture. Getting back to nature, the afternoon is dedicated to Peguche. This huge waterfall is praised during religious celebration. Peguche is entirely part of the indigenous culture. It is an incredible gift from nature to be admire from any side (and we know one hidden path!). 12, 943 ft high, to start their ascension up to Pichincha Volcano (15 413 feet high). There they can admire the capital of Ecuador: Quito. Indeed, this volcano is right next to the city, and offers an amazing panoramic view. The path gets tighter and tighter when getting closer to the top, which adds an intensified feeling to this trek. Advanced group: taken to the top of the Pichincha. 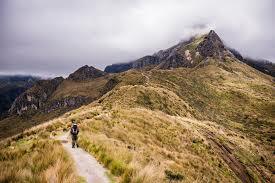 Once the group is reunited, they will have the choice to ride a bike down the Pichincha or take back the cable car. Lunch will be eaten during the trek and travellers will then be driven to their hotel. 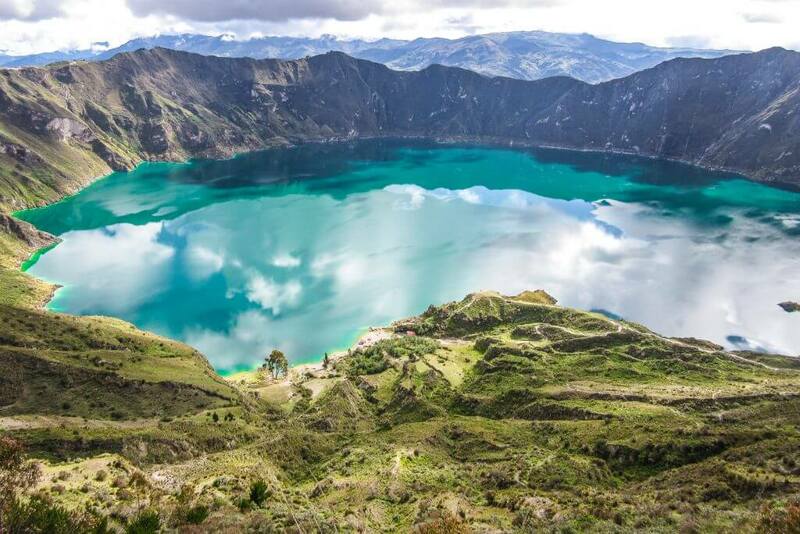 Visitors will walk to the heart of the Quilotoa crater (12 841 feet high), made from a volcano, and discover it in a unique way: by kayaking on its lake! 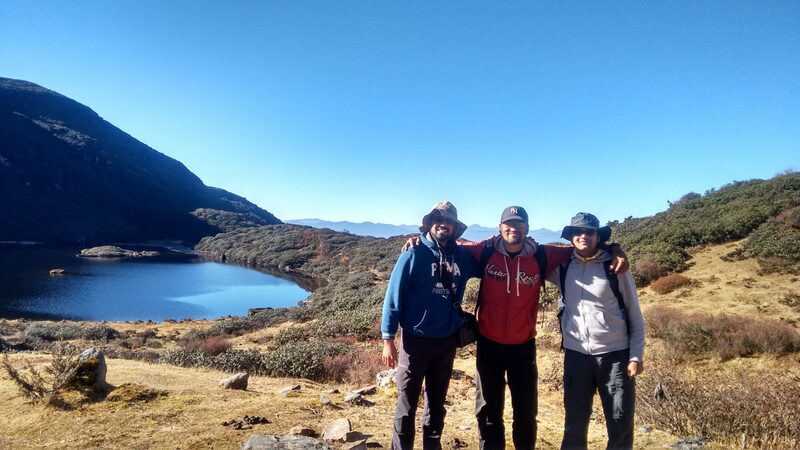 Camping in Quilotoa lake is totally possible for this night or you can head back to your hotel. We will drive to Baños, where everyone can get a much deserved rest at the hotel after these strenuous days of hiking. Who never dreamt of a swing into the void? La casa del Arbol (the tree house) will make their dream comes true, with this swing and a bunch of other activities (ziplines, balanced displayed as a wooden log up to the water, etc…). After this breathtaking view, travellers will walk deep into the forest to reach and admire the huge waterfall: Pailon del diablo and know more about its fascinating story. On the way there, they will see different waterfall, and impressive bridges that leads to them. Guests will be taken to a local dinner, before experiencing a ceremony of rituals by indigenous communities. They will then head back to the hotel to rest after this adventurous day. Guests will start the day in the best way: doing rafting along a river! Adventurous group: They will be going to “Parque de Aventura” (adventure park), offering ziplines, wall climbing, a moving bridge and many other outdoor adventurous activities. The second group will be taken to a wonderful waterfall tour, horseback riding and an easy mountain hike to be fulfilled by Ecuador’s nature. After this the guests will be driven back to Quito. show the guests more about Quito (Metropolitan park, or Centro Historico for example). "It's one of the most beautiful country I have visited so far. The best experience was to kayak in the Lake. A must for all avid travellers "